Both engines have been replaced. Bayliner fiberglass construction is well known. Hull and deck are hand laid up and the hull to deck joint is well sealed. Engine stringers and transom have extra layers of glass to support the out drives. This a traditional express cruiser layout. Entering the boat from the transom door you find a U-shaped dinette to starboard with a removable table. There is an ice chest located under the center seat for additional storage. To port is a small sink and counter with storage under it. With the table removed there is a large hinged deck hatch to access the engines and mechanical equipment. Moving forward you find a double helm seat to starboard with a companion seat to port. Access to the foredeck is through an opening windshield. Moving into the cabin, the head and shower is located to port with the guest sleeping area to starboard. This includes a hanging locker and privacy curtain. The galley is next on the port side including a fridge, microwave, sink and alcohol/electric stove. The U shaped dinette is opposite the galley and this converts to a berth. There is ample storage under the dinette and in the galley. The master double sleeping area is forward and it also includes a privacy curtain. There is a lot of additional storage under this berth. This boat has been kept under cover for the past several years and is a clean example of this popular Bayliner model. A major positive of this vessel is that both engines have been replaced in the last two years. Outdrives have been serviced regularly as well as the engines. The interior supplies two separate sleeping areas for four adults. There are a surprising number of extras included such as dock and lock lines, bed linens, cleaning supplies, galley dishes, plus a lot of small items. A list is available. Located at our docks on Lake Union. Please call for a viewing. 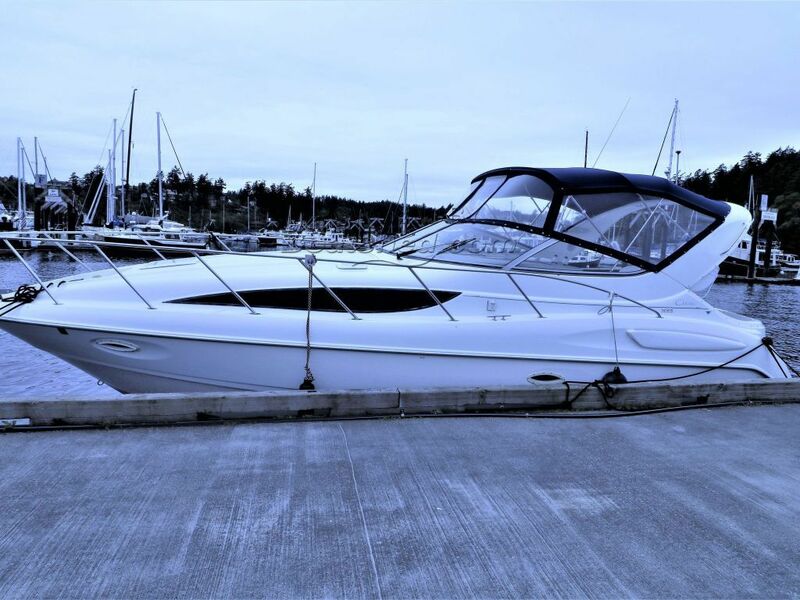 This Bayliner 3055 Ciera LX Sunbridge has been personally photographed and viewed by Roger Drill of Boatshed Seattle. Click here for contact details.